MASSACRE GUN: Crime Noir With Nihilistic Cool – Schlockmania! Jo Shishido was one of the great tough guys of Japanese action cinema. With his brooding charisma and unusually puffy cheeks (the result of augmentation surgery), he cut a distinctive figure on the busy Japanese genre cinema landscape. He could handle a gun or duke it out with equal aplomb and built his leading man reputation on a string of cop and crime flicks made for Nikkatsu during the 1960’s. 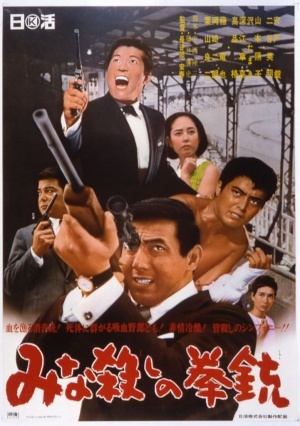 Massacre Gun was one of many and it mixes brutal action, melodrama and a sense of icy cool in a memorable way. In Massacre Gun, Shishido plays Kuroda, a gangland enforcer who is stifled under the rule of cruel boss Akazawa (Takashi Kanda). However, the boss goes too far when Kuroda’s brother, aspiring boxer Saburo (Jiro Okazaki), tries to resign from the boss’s sponsorship and gets savagely beaten. Kuroda teams with his other brother, the hotheaded Eiji (Tatsuya Fuji), to muscle in on the boss’s operation. They are successful but Akazawa still has a few moves he can make – and Kuroda’s former enforcer pal, Shirasaki (Hideaki Natan i), is honor-bound to have a showdown with his old friend. The above synopsis might sound familiar to any veteran of crime fare but Massacre Gun gives it fresh life via the stylish way its told. Director Yasuharu Hasebe gives it a moody approach that is as brooding as its antihero: the lustrous black-and-white photography creates a look that is alluring and chilly all at once and the use of a nightclub jazz-style score provides an intriguing contrast to the brutality. There’s even a singer in Eiji’s nightclub who acts as a sort of Greek chorus, singing songs of existential loneliness that complement the action. These choices give the narrative a hypnotic pull, drawing the viewer into a stylized reality where doominess and cool walk hand in hand. However, Massacre Gun isn’t all mood: the action is frequent and hard-hitting, with brutal punchups and shootouts being a regular part of the landscape. Hasebe isn’t scared to get grim with the viewer – the opening has Kuroda killing a woman in love with him because the boss said so – and everything builds to an unforgettable showdown on a deserted stretch of motorway that reflects the nihilistic mindsets that Kuroda and Shirasaki have about their chosen profession. The director captures the excitement of these scenes while also presenting them as an extension of the film’s doomy mood, the price that the characters have to pay for their stylish lives of crime. Massacre Gun also benefits from intense performances that act as a counterbalance to film’s icy style. Okazaki has the charm to pull off the nature of his audience identification figure role while Fuji is compelling as the brother who loves gangland life a little too much. However, it’s Shishido who drives the film with a quietly charismatic performance. He’s a man of action who seldom makes eye contact with those he speaks to, as if haunted by the ever-present idea of impending doom. This approach gives his work a grim weightiness that keeps the film anchored around his gloomy persona. 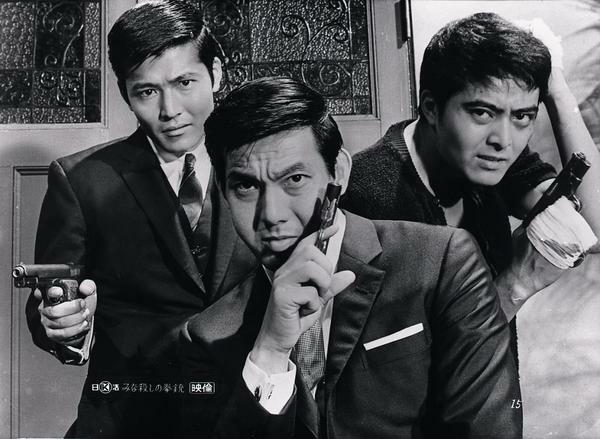 In short, Massacre Gun is both a great example of ’60s Japanese crime noir and a great example of how Shishido could carry such an enterprise with his unique leading-man style. Either way, it’s a winner for a cult movie fans who like tough guy cinema. Blu-Ray Notes: This film just made its U.S. high-def debut via a new blu-ray/DVD set from the American arm of Arrow Video. The transfer looks fantastic on the blu-ray, offering a richly detailed image that captures all the details and shades of grey beautifully. The mono Japanese audio sounds good, presented with English subtitles and in lossless form on the blu-ray. Arrow has also included a fistful of extras. The first is a 17 minute interview with Shishido, who reflects on how he preferred shooting crime films in black and white and how he choreographed his action scenes, including a demonstration of his quick-draw skills. Another featurette has critic Tony Rayns offering a 36-minute history of Nikkatsu from its inception to its decline, covering all its phases on a decade by decade basis. It’s great, educational stuff for fans and neophytes alike. A stylish, punchy trailer and a quick set of black and white stills round the disc. 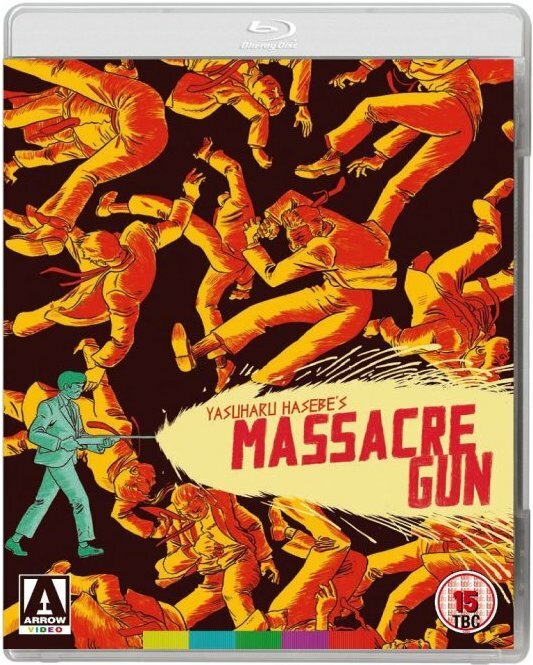 The overall package is completed by an informative and skillfully crafted set of liner notes from Jasper Sharp that discuss Massacre Gun in the context of the “Nikkatsu Noir” crime/action film cycle.